We left Calgary at the beginning of October and we had already had our first big snowfall! We decided we would immediately start our Pan-American journey by heading south so we could check off some must see sites before even colder weather arrived. We headed towards Cardston, Alberta with the intention of driving the Going-To-The-Sun Road which goes right through Glacier National Park in Montana. Crossing the border near Cardston, was a non-event, no line and no questions. We had Roo’s paperwork ready to go and the border agent didn’t even want to look at it! (For entering the USA from Canada with a dog all that is required is proof of the Rabies Vaccine). After sailing through the border crossing our first stop was the town of St. Mary’s on the North-East end of Glacier National park. Luckily, we were able to get gas by paying at the pump because everything else in this area was closed for the season. We stopped in at the St. Mary’s visitor center and they informed us that the Going-To-The-Sun Road was temporarily closed due to snow so we unfortunately couldn’t take our planned route and had to loop around Glacier National Park and enter from the West side. Montana does not disappoint in terms of views, even when driving on highways we saw amazing mountains, river valleys and forests. While it somewhat reminded us of home there was this sense of vast emptiness that seemed to go on forever, that accompanied with the rolling hills and valleys served to remind us were somewhere different. I think the extra feeling of emptiness was largely due to us travelling off season and seeing no other people for miles of highway, in addition to encountering mostly deserted towns that were closed up for the winter. So far, we have managed to find amazing free campgrounds! Thank you to those who also use iOverland and share their camp spots! 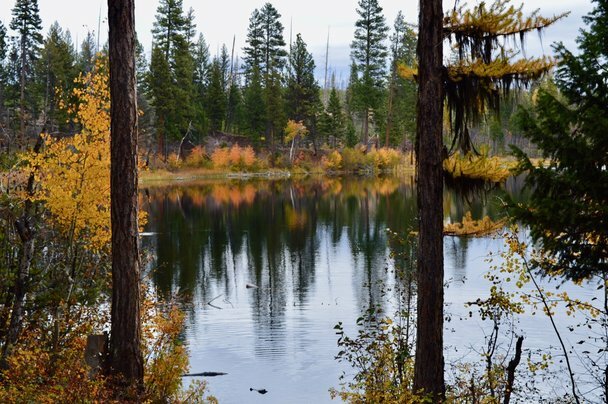 All of our campsites have been on National Forest land, and because we’re travelling in October we have largely had them all to ourselves. We slept by a river bed, lake, and a small tumbling creek – there is no shortage of natural water sources here! We did venture down windy, deserted gravel roads to get to some of these spots but in the end, the result was always worth it! Roo, has enjoyed having space to roam around, and seems to be a fan of exploring each new campsite. 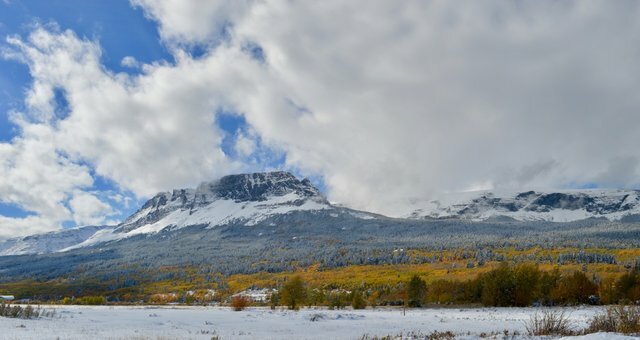 Glacier National Park – amazing views, however much was closed for the season. Glacier National Park is also not very dog friendly and dogs are not allowed on trails or in the backcountry due to bears. Given this we spent most of our time exploring the National Forest’s outside of Glacier National Park. Garnet Ghost Town – if you are ever in the area this is worth checking out! 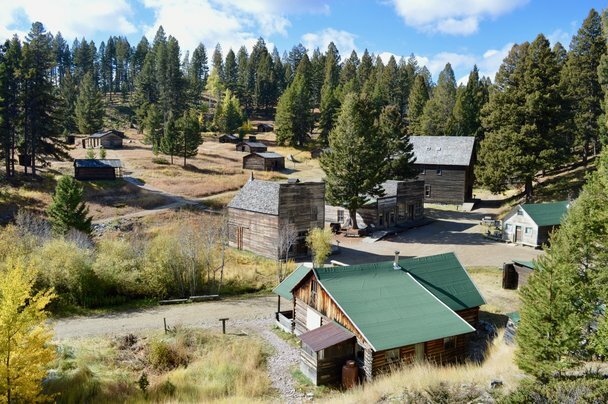 This Ghost Town was built during a gold rush in the late 1800’s and is incredibly well preserved. The Ghost Town is on BLM (Bureau of Land Management) land and you can actually camp fairly close to the town. We were even able to walk Roo though the Ghost Town! Butte – this made the list as we found amazing fresh doughnuts and cookies at a bakery here called Town Talk for a whole $2.95. (I won’t say how many doughuts and cookies were included in this price… but let’s just say it was super reasonable!) Thank you, Google. Roadtrips are always made better when you find local food stops along the way! Bozeman – we planned to camp near here but ended up driving a little farther so our experience in Bozeman was largely limited to the off-leash dog park. If you are every traveling with your dog through Bozeman they have a great off leash park called Snowfill Recreation Area. It has over two miles of trails. Roo’s highlight was meeting a one-year old retriever named Charlie that became her new buddy. Overall, we really enjoyed Montana, and the only reason we didn’t stay longer was largely due to the cooler temperatures (especially overnight!). While we have been toasty warm sleeping in the insulated truck bed it the cold does limit evening activities and we have found ourselves making our way south in search of slightly warmer weather. Yellowstone National park is next though and there is snow in the forecast!